Software giant Microsoft took to video sharing service Vimeo to disseminate its new commercial promoting the Internet Explorer 9 browser. Tentatively named “A More Beautiful Web,” it features a soundtrack by Alex Clare and fast-paced (albeit a tad amateur-looking) MTV style editing. Both treats are not usually associated with neither the Microsoft brand nor the company’s dull television advertising. While watchable, it does not hold a candle to Google’s memorable Chrome advertising. The 60-second video highlights the browser’s headlining features, such as hardware-assisted canvas rendering, high-definition video playback, rich web apps like Chillingo’s “Cut the Rope” game, and more. 1. The commercial was a Vimeo exclusive at post time— despite Microsoft’s official presence on YouTube, including the Internet Explorer team’s channel. It is interesting that Microsoft chose to tap a rival video sharing service and not leverage the world’s most popular destination for online video to get the word out. An anti-Google move, cynics might say. 2. Per data from StatCounter (see the chart below), the Windows maker’s possible motivation to bypass YouTube likely includes Internet Explorer’s continuous downward spiral. It has been a trend, not a temporary hiccup. 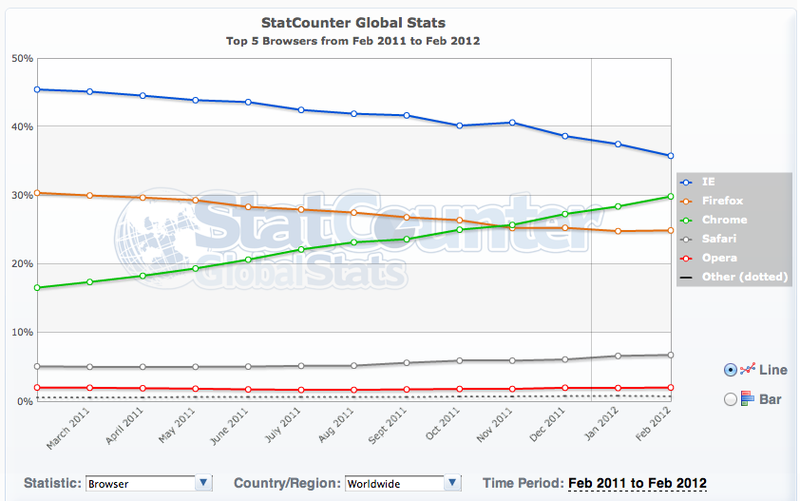 Last summer, Google’s Chrome claimed one-fifth of the worldwide market for browsers and is now No. 2 in some key markets that traditionally favor Microsoft’s product. Microsoft appeared late to the party and has lost momentum in browser innovation that now almost exclusively belongs to Google and —in small part— to Apple and its Safari browser. If it were not for big businesses’ reluctance to upgrade to a more modern browser, Internet Explorer would already be severely beaten in browser wars. The writing has been on the wall for quite some time, indeed. According to a recent comScore research, Google-operated websites accounted for nearly half of the 40 billion online views in January 2012. Rival Hulu and VEVO delivered 877 and 717 million views, respectively. In addition to Google websites, VEVO (51.5 million), Yahoo websites (49.2 million), Viacom Digital (48.1 million) and Facebook (45.1 million) round-up the top five online video destinations in the United States. The research only covers websites that host premium Hollywood entertainment, so Vimeo is not included. Vimeo, an IAC-run video sharing service, commanded an estimated 65 million eyeballs and 8 million registered users as of last December.